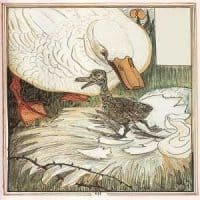 The Ugly Duckling Audio Story ~ Audio Stories for Kids No Reviews Posted. The Classic Tale of The Ugly Duckling- A Mama Duck is proud when her six ducklings hatch from their eggs. But one duckling does not look like the others? This is the Fairy Tale The Ugly Duckling Story. It has been adapted from Hans Christian Andersen and is brought to you by Stories to Grow by. On a farm long ago, a Mama Duck sat on her nest. “How long must I wait for my babies to hatch?” she said. “I have to sit here all alone! And no one comes to visit me.” But what could she do? A Mama duck must keep her eggs warm till they hatch. But one large egg was still in the nest. “Well," said Mama Duck, "it looks like that big egg will take more time.” So she had to go sit on her nest again and wait some more. The next day, the big egg started to hatch. Out came a baby boy bird. But if one may say so, it was an odd-looking thing. This bird was much bigger than others. He was not yellow at all - he was dark-gray from his head to his feet. And he walked with a funny wobble. “I have never seen such an ugly duckling!” said another. Yet the other ducklings quacked, “Ugly! Ugly! Ugly!” The Ugly Duckling did not know why the other ducklings were yelling at him. He took the last spot in the line. Each yellow duck jumped in the river and swam behind Mama Duck. When it was his turn, the Ugly Duckling jumped in and started to paddle, too. “At least he can swim,” Mama Duck said to herself. When Mama Duck was close by, she would not let them talk in this way. “Be nice!” she would scold. But she was not always close by. That night, the Ugly Duckling flew over the farmyard fence. He flew till he landed on the other side of the lake. There he met two grown-up ducks. “Woof! Woof!” Suddenly a big hungry dog came tearing by, chasing the two ducks. They quickly flew up in the air, and their feathers fell down on the ground. The poor Ugly Duckling froze in fear. The dog sniffed and sniffed at the Ugly Duckling, then turned away. “I am too ugly even for the big hungry dog to want,” said the Ugly Duckling with his head hung low. The sky turned dark. Crack! A bolt of lightning. Then came a big storm, with heavy rains pouring down from the sky. In just moments, the Ugly Duckling was soaked through and through. Then a cold wind started to blow. Suddenly a big hungry dog came tearing by, chasing the two ducks. He flew to the door. “Quack?” said the Ugly Duckling. The door of the hut creaked open. “What is all this noise?” said an old woman, looking right and left. Her eyes were not that good. Then she looked down. “Ah, look at that, it’s a duck!” She picked up the Ugly Duckling and dropped him inside her hut. “You can stay here, but only if you lay eggs,” she said. A tomcat and hen crept up to the Ugly Duckling. “Who do you think you are, coming in here and taking up room by the fire!” said the tomcat. “Get out of here, pretender!” clucked the hen. “Get out! Get out!“ hissed the tomcat. “Why are you still here?” said the tomcat. “No one ever wants me,” said the Ugly Duckling with a tear in his eye. The storm ended. Soon he found a new lake. Looking into the water, the Ugly Duckling saw the reflection of a flock of large white birds flying. He looked overhead and could not believe what he saw. There, above him, were the most beautiful birds he had ever seen! Their long white bodies and slender necks seemed to just glide through the sky. He watched until the very last bird had winged its way out of view. He stayed at that lake all by himself, and time passed. The leaves of the trees turned deep red and gold, and then the leaves fell to the ground. Winter came, setting a blanket of white snow all over. The cold wind and the dark clouds made the Ugly Duckling feel even more sad. He had to go into the cold, cold lake to fish, but it was getting harder to swim. The lake was turning to ice. One day, it was all he could do was to paddle the water to keep it from freezing around him, and trapping him in the lake. “I am so tired!” he said, paddling with all his might. The ice got thicker and drew closer to him. In a moment, two giant hands swept him up. “You poor thing!” said a farmer. He held the Ugly Duckling close to his thick wool jacket and took the bird to his home. “You poor thing!” said a farmer. Never was a warm fireplace more welcome! For the rest of the winter, the farmer cared for the Ugly Duckling. Then spring came. Tips of green covered the trees. Short, bright flowers popped up from the ground. “It is time for you to go to the lake to swim again, as you were born to do,” said the farmer. He took the duckling back to the lake where he had found him, and set him with care on the water. He heard quiet splashing sounds behind him, and turned around. A flock of those same beautiful birds he had seen in the sky before landed behind him on the water. “Do not worry!” he said to them, holding out one wing. “I will go now. I will not make trouble for you.” A big fat tear rolled down his cheek. He turned to go away. When he opened his eyes, he saw a reflection in the water of one of those beautiful white birds. Why was it so close to him? He jumped back. And the reflection jumped back, too. A big fat tear rolled down his cheek. “What is this?” he said. He stretched his neck, and the reflection of the beautiful bird stretched its neck, too. “Why are you going so soon?” said one of the beautiful birds. Then, the bird who used to be the Ugly Duckling knew what had happened! He was no longer an ugly gray bird that wobbled when it walked. He was now a beautiful white swan! At one moment, all the swans flapped their wings and took off into the sky. “Come with us,” one called back. “Take the lead!” So he flapped his wings fast and took his place in front of the whole flock. All his new friends flapped their wings behind him.